How to dress up and standout (even when you're vertically challenged)? See photo below. I think we need a lot of tips from the President herself. 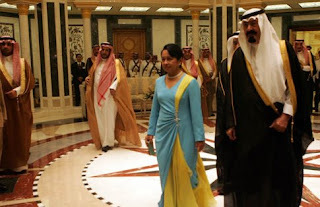 Gloria Arroyo seems to be in track in what's hot and what not. Ranked 51st in the Forbes Magazine "The World's 100 Most Powerful Women"
According to Bill Blass: "When in doubt, wear red". I noticed the President loves the color red. She even wore a red terno last SONA. Is the President always in doubt? What is she wearing right now? What is she thinking? hi baby! I just wanna say Im so proud of you. Beautiful and interesting blog here!